Blog home / Everything CBTN / Why Not Have Lifetime IT Certifications? There have been a lot of certification exam changes in the past couple years. We’re now almost exactly a year out from the big MCSE certification retirement at Microsoft. Cisco is already working on their reboot of CCNA. This month, CompTIA released the new Network+ exam. It’s hard to keep up, know what’s next, and know how to keep current. If you’ve worked in technology for a little while, you know that change is a way of life. Technology moves and the certifications follow. It’s a valuable cycle that lets IT professionals learn (or validate) their skills, and provides employers with a good gauge for performance — and even regulatory compliance. There are a number of reasons that IT certifications change. We argue that there’s an equal (and perhaps even greater) number of reasons why IT certifications shouldn’t last a lifetime. When CompTIA put a three-year expiration date on the A+, Network+, and Security+ certifications back in 2011, IT industry professionals rose up in protest. They bombarded CompTIA with negative feedback (to put it kindly). Much of the rancor was directed toward the fact that each of their flagship certifications would be retroactively expired. To industry professionals, that meant the Good-for-Life certifications would expire. IT professionals came out en masse to protest the change legalistically, linguistically and financially. As one IT professional put it, “This is the agreement I entered into, which has now fundamentally changed, it is not an agreement I would now knowingly have entered into, yet I have no recourse or right of refund.” To my knowledge, no legal action was ever taken, but language like this was pretty common at the time. Others simply went tautological in their response, point out that Good-for-Life meant good for life. We’ll mark that down in the linguistic category — and its valid (because it’s valid). It was a PR nightmare for the Illinois-based non-profit. CompTIA eventually ended up walking back the retroactive policy and grandfathered anyone who passed the exam prior to January 1, 2011, into a lifelong certification. But they stuck to their guns on a new Continuing Education Credit (CEU) policy that’s still in place today. The swift rate of technological change is a logical starting point in the argument against lifetime certifications. To illustrate this point, we look no further than NetWare. There’s an unverified claim that Novell claimed 90 percent of the PC-based server market before Windows NT. The number isn’t important. Instead, you should know that Novell’s Netware was everywhere — until it wasn’t. For a time, Netware Certified Engineer was the gold standard of networking certifications. The software line took time to fall out of favor, and then out of service. Though, the software line is discontinued now. There undoubtedly are still Netware Certified Engineers in the workforce, but they’ve also probably earned advanced Microsoft or Cisco certifications. There’s an argument to be made in this example that market demand for certain skill sets will drive the supply. To say it another way, IT professionals aren’t just going to sit still while the industry moves away from them. They’ll move toward the next technology because their careers depend on it. To side with the IT pro for a moment, Good-for-Life certifications were a hands-off approach to managing training for an entire industry. An IT professional would enter the workforce and then progress organically through on-the-job training. However, the certification only then has a single use — entering the workforce or perhaps advancing from an entry-level position. To be fair to CompTIA, they made it fairly simple to recertify. IT professionals didn’t need to retake an exam unless they hadn’t earned a higher certificate, attended a conference, or joined even a few webinars in the past three years. CompTIA wasn’t necessarily taking anything away, they were trying to give IT professionals credit for the things they already do. Test takers might be the customer for organizations like CompTIA, but they’re not the only stakeholder. Certification-issuing organizations like CompTIA represent many interests — including industry employers, accreditation agencies, and the big IT vendors. Lifetime certifications might make sense to employees, but employers want to know that their workforce is properly trained in current technology. There’s only so much a single organization can do to ensure compliance with regulatory or internal guidelines. Validated industry certifications let them know that their technical staff has the knowledge and skills necessary to do their job. Certifications also help employers compare job candidates against a known standard. Like it or not, certifications often help employers not only sort a stack of resumes but also guide professional development. If there’s a single line that illustrates the fact that CompTIA is being pulled in multiple directions, that’s it right there. Both vendors and vendor-neutral certification-issuing organizations have been dancing around “lifetime certification” for years. For instance, Microsoft recently changed their Microsoft Certified Solutions Expert (MCSE) and Developer (MCSD) certification pathways, and we wrote about it in early 2017. They did things a little differently than CompTIA. Namely, they went the opposite direction. It used to be that IT pros had to recertify every few years. Now, Microsoft touts that certifications never expire. In changing the terms, Microsoft found a middle ground with a big asterisk. Yes. Your certification never “expires.” However, you need to take an exam every year to remain “Active.” According to Microsoft, it’ll be up to individuals, employers, and regulatory bodies to determine whether they consider an “Inactive” certification to be valid or not. Similarly, individual exams never expire. They’ll live in an MCSE or MCSD transcript. Retired exams move to a Legacy section. 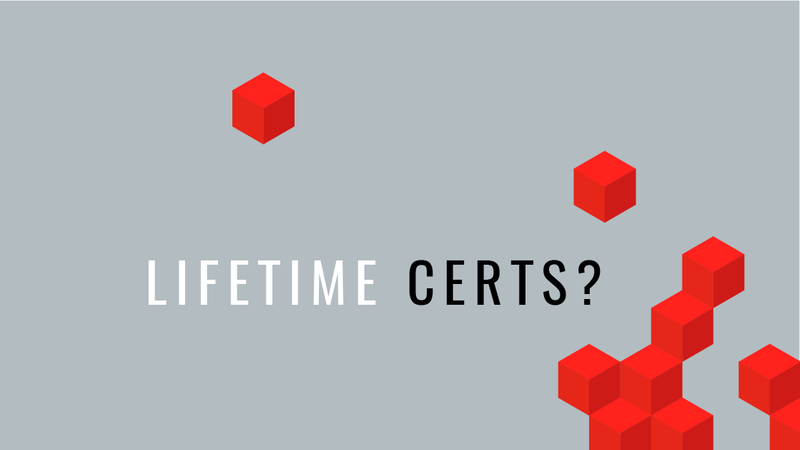 It’s unlikely that we’ll see lifetime certifications again. Technology moves too fast. Business demands change constantly. If anything, we’ll continue seeing an influx of new certifications that validate the skills of emerging technologies — like machine learning, software-defined networking, and advanced data analysis. As the technologies mature into entirely new IT sectors, certifying organizations will turn specialized certifications into entire pathways. There’s a precedent for this. If you’ve been around awhile (like Keith Barker), you’ll maybe even remember that CCIE preceded CCNA. Cisco’s expert-level CCIE was introduced in 1993, to be followed by the more accessible CCNA in 1998. As the tools and technologies change, so will the certifications that support them — they just won’t be valid for a lifetime.